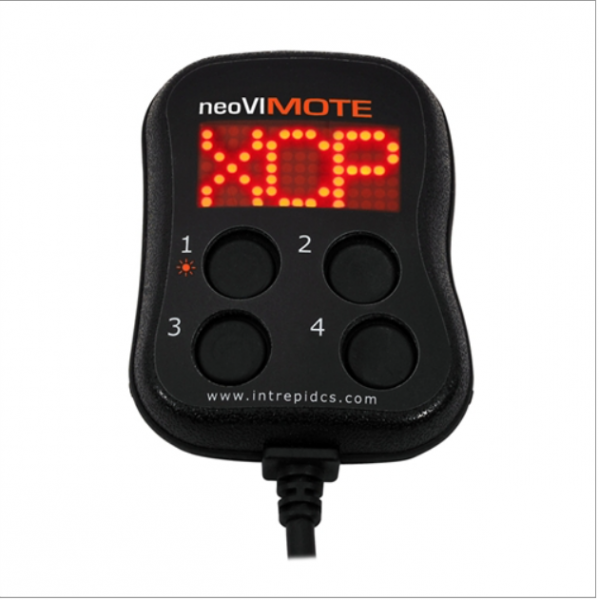 neoVI MOTE is a scriptable CAN node with 4 buttons and audible feedback. Specially designed as a pendant for in-vehicle applications, it easily mounts to the dashboard and has a sunlight readable display. • Use as triggering device for CAN data logger (works with any CAN tool). • Use to adjust ECU algorithms on the fly using XCP or CCP. • Build your own custom diagnostic tool. • Simulate an ECU and make signals adjustable using buttons. • Parking lot ECU flashing display. • Power management with automatic CAN or Button wakeup with under 200uA sleep current. • RS232 port with power control for accessories such as Bluetooth or GPRS modem. • CAN bus with settable termination. • Buzzer allows different tones via script for various types of audible feedback. • Sunlight readable display with automatic scroll feature to accommodate text wider than the display. neoVI MOTE's scripting feature allows you to program the pendant to do complex message transmission and decoding for such protocols as XCP, GMLAN, ISO14229/UDS, and J1939. Related links to "neoVI MOTE"
Customer evaluation for "neoVI MOTE"